A cross between a Golden Retriever and a Standard Poodle, a Goldendoodle has an awesome name and a great personality to match. As a cross breed, it is very difficult to determine whether a puppy will show more characteristics of a Poodle or a Golden Retriever, but Goldendoodles are typically smart, sweet and playful (so you could say you get the best of both worlds). It is important to note that any breeder who claims to be able to control the look and temperament of a cross breed dog is not being truthful and is best avoided. Goldendoodles make great guide and therapy dogs and their size, trainability and easy nature make them good with children. They love being around people and are very sociable. They were developed mainly as a hypo-allergenic guide dog - Poodles are hypo-allergenic and Golden Retrievers make excellent guide dogs. The combination, though, as mentioned before, cannot be guaranteed, creates a highly trainable, hypo-allergenic dog. Both parent breeds are prone to hip dysplasia, which means the Goldendoodle puppy is too. They require moderate amounts of exercise so can live in an apartment, but do need daily walking. 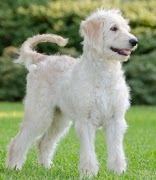 By joining this group, you club together with other owners to get a great deal on pet insurance for your Goldendoodle.